GARRET MEADE PHOTO | Mattituck goalkeeper Steve Ostrowski watching action in his penalty area. The Town of Brookhaven Summer League small schools champion Mattituck boys soccer team didn’t seem overly concerned about the prospect of playing the league’s large schools champion, Central Islip, on Wednesday night. After all, the Tuckers are accustomed to playing against teams from larger schools. What the Tuckers may have found disconcerting, however, was Central Islip’s lethal speed and skill. So good that the 1-0 scoreline in Central Islip’s favor doesn’t do the Musketeers justice. Only resolute defending by the Tuckers and capable goalkeeping by Steve Ostrowski kept it close. The Tuckers were under no illusions. They recognized the task that lay before them in the game for the league’s overall championship. “We knew we had to defend,” said Hayes. So the Tuckers defended and looked to counterattack when they could. The strategy worked for the first 49 minutes 41 seconds of the 60-minute game, before Central Islip gained its well-deserved reward through a penalty kick. Ever Manzanares was fouled in the penalty area and Robenson Jasmin, the game’s most valuable player, directed the spot kick into the net for the game’s only goal. GARRET MEADE PHOTO | Central Islip’s Osman Portillo Jr., left, and Mattituck’s Paul Hayes pursuing the ball. Central Islip, in only its second year in the 33-year-old summer league, earned the right to play the Town of Babylon champion tomorrow night at St. Joseph’s College. Mattituck won the overall summer league championship once, in 1999. That speaks to the difficulty of advancing that far. Of course, the Tuckers would have needed to get by Central Islip in order to do that, and that proved to be a problem. Central Islip did something that not many teams do to Mattituck. It essentially boxed the Tuckers in their own half of the field at Diamond in the Pines in Coram for much of the time and applied a great deal of pressure on Mattituck’s defense. 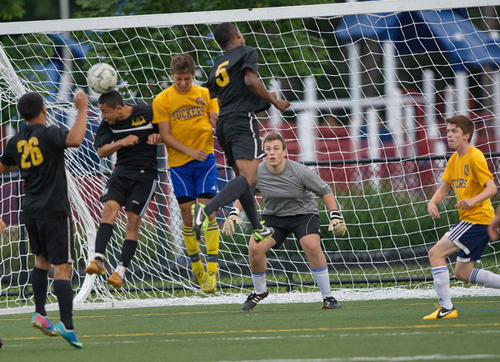 Central Islip was denied a goal in the 34th minute when Ostrowski made a snazzy diving save of a shot by Jorge Magana, catching the ball and not leaving a rebound. The Musketeers missed a couple of good scoring chances in the second half as well: Magana’s side volley was directed right at Ostrowski in the 40th minute. Eight minutes later, Magana nearly had a clear shot at goal, but it was deflected by a defender at the last moment for a corner kick. Central Islip outshot Mattituck, 13-4, but the Tuckers had a couple of opportunities themselves. Mario Arreola, who has scored 17 goals in 13 games this summer, exhibited his splendid speed on a memorable sequence almost five minutes into the second half. He somehow managed to catch up with a midfield ball that looked as if it would roll out of bounds. Arreola then pushed the ball forward down the left wing and beat a defender to it before curling a shot beyond the right goalpost. “I didn’t know it was possible, but I think he has gotten faster,” said Mattituck’s school team coach, Mat Litchhult. Arreola was also involved in Mattituck’s only other serious attempt at goal He latched onto an incisive through ball from James Hayes in the 44th minute, only to see his right-footed effort stopped by Rene Melgar for one of his two saves. Mattituck was missing three players who probably would have started: Kaan Ilgin, Jake Jacob and Oscar Puluc. Ostrowski was the only senior on the field for the young Tuckers. It was a productive and encouraging summer season for Mattituck, which won 10 games and lost three, outscoring opponents by 35-17. The Tuckers finished second to Center Moriches on goal difference in the regular-season standings. After losing two of its first three games, Mattituck won nine straight during a stretch. The Tuckers seemed happy with the T-shirts they were awarded after the game along with their small schools title plaque. With the school team’s first preseason practice scheduled for Aug. 26, they gave themselves something of a head start on preseason training and a healthy dose of good feeling.